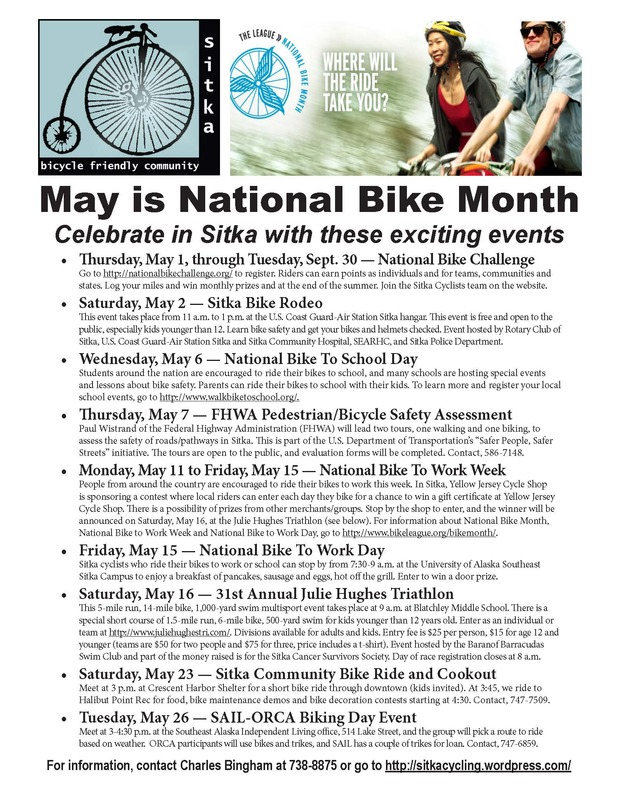 The City and Borough of Sitka, in cooperation with Sitka Trail Works, has been working on improvements to and reconstruction of the Sitka Cross Trail since last spring. 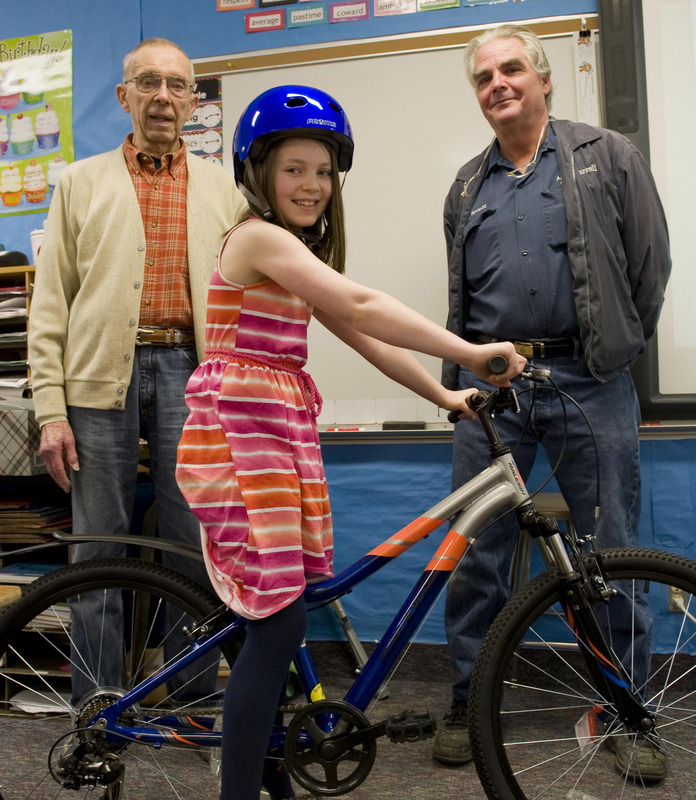 Using grants the city received from the Alaska Department of Transportation and the Federal Lands Access Program (FLAP), a Rasmuson Foundation grant and Sitka Trail Works donations, 1.25 miles of new trail is now complete. 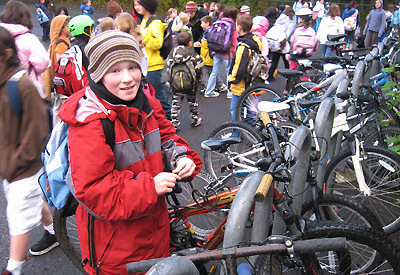 The old Cross Trail has been upgraded to an eight-foot-wide multimodal pathway standard, from Sitka High School to Yaw Drive and a separated path was constructed along Yaw Drive to the Indian River Trailhead parking lot. If walkers park in the Indian River/Cross Trail Trailhead parking lot off Indian River Road, the separated path now starts across the road at Peter Simpson Drive and runs along Yaw Drive to the main Cross Trail. 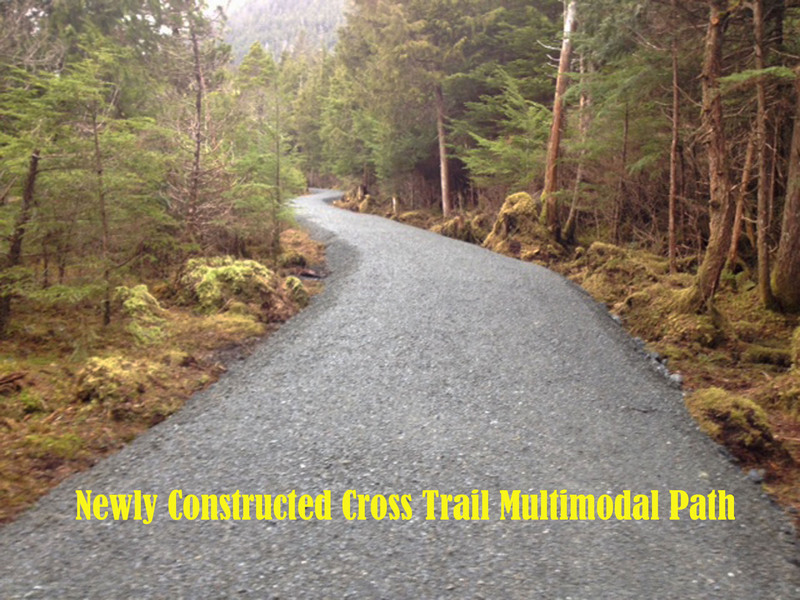 Sitka Trail Works has begun construction of Phase 5 of the Cross Trail Multimodal Pathway. 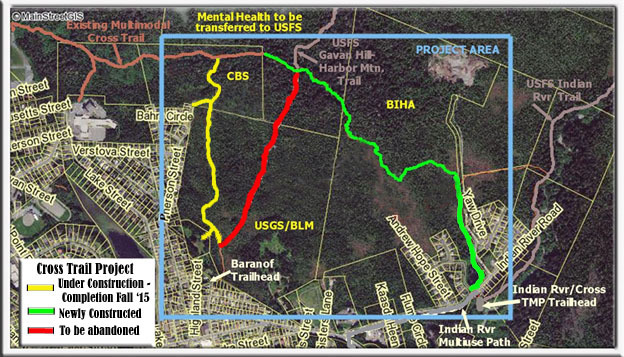 Approximately one mile of multimodal trail will be constructed to replace the lower portion of Gavan Hill Trail. The new section of the Cross Trail will share a trailhead with the Gavan Hill Trail at the end of Baranof Street. 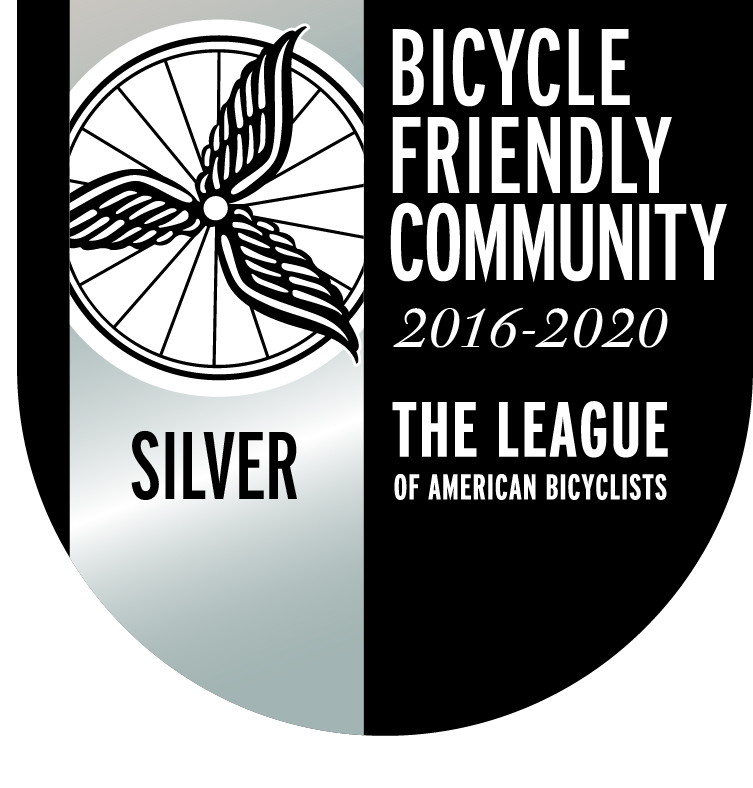 The Phase 5 pathway will provide access to the Cross Trail and Gavan Hill Trail from downtown and surrounding neighborhoods. The lower part of Gavan Hill Trail will be abandoned. During construction heavy equipment will be using neighborhood streets. Trail construction materials will be staged at the end of Pherson Street and adjacent to the city cemetery. Residents are asked to “excuse our mess,” truck traffic and noise during construction, and avoid the staging areas. Construction will be complete in the fall. 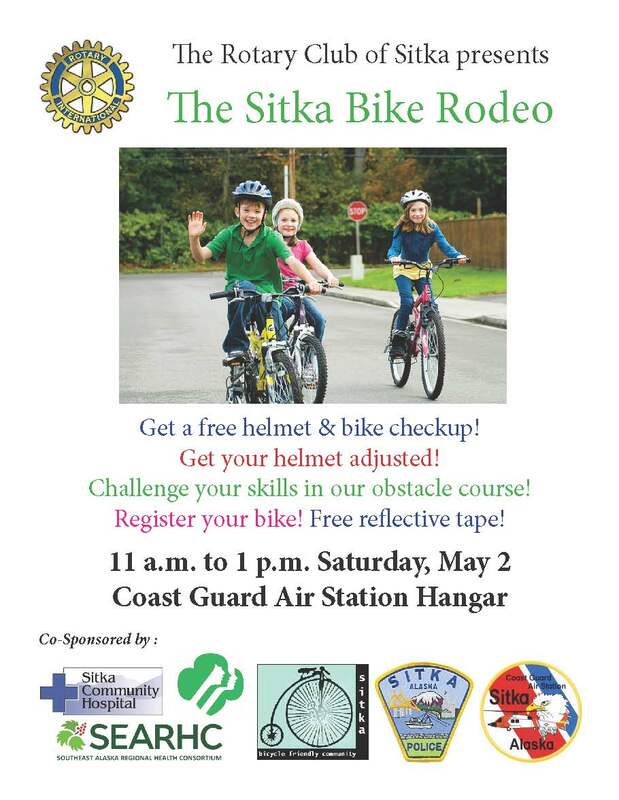 For further information, please contact Lynne Brandon of the Sitka Department of Parks and Recreation at 747-1852, or Deborah Lyons of Sitka Trail Works at 747-7244. 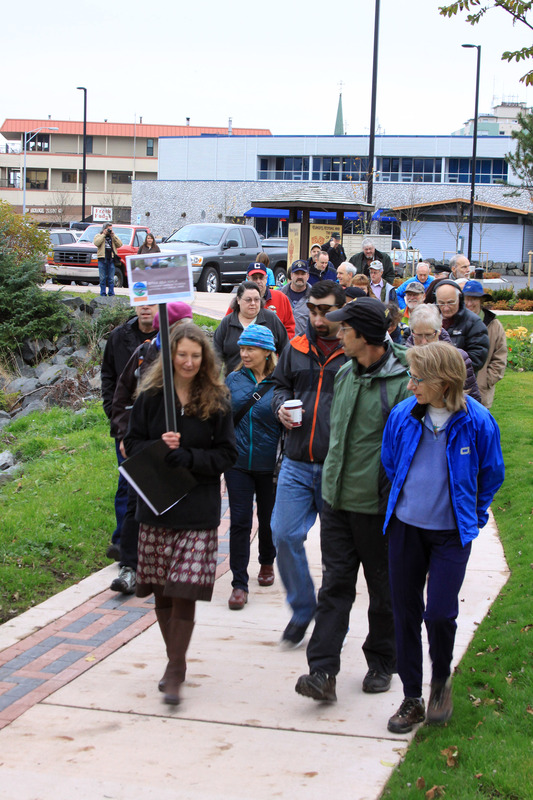 The walking safety assessment meets at Harrigan Centennial at 9 a.m., and after some introductory comments will include a the first segment of the hike along the Sitka Sea Walk to Sitka National Historical Park. The second segment of the hike will be to the Alaska Raptor Center, before participants return to Harrigan Centennial Hall and a lunch break. 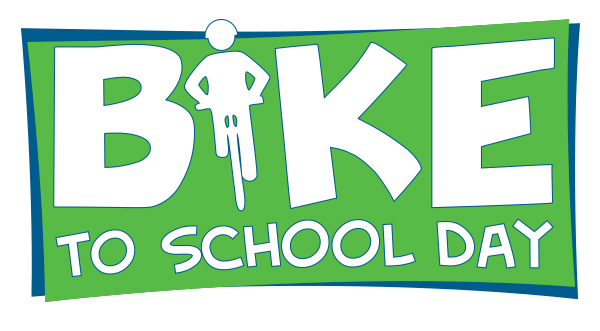 After lunch, participants will meet back at Harrigan Centennial Hall to mount bicycles for a bike tour along Halibut Point Road to Pioneer Park (near Sea Mart) and back. 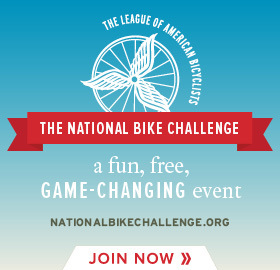 After each tour segment, participants will complete a short evaluation form. Maps are part of the first attachment linked below. 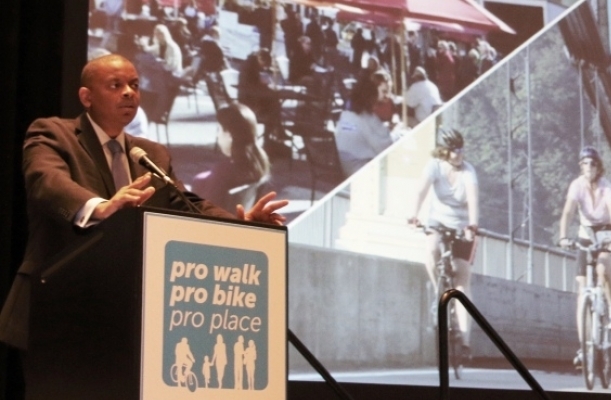 U.S. Transportation Secretary Anthony Foxx announces the Safer People, Safer Streets Initiative during the Pro Walk Pro Bike Pro Place convention in September 2014. 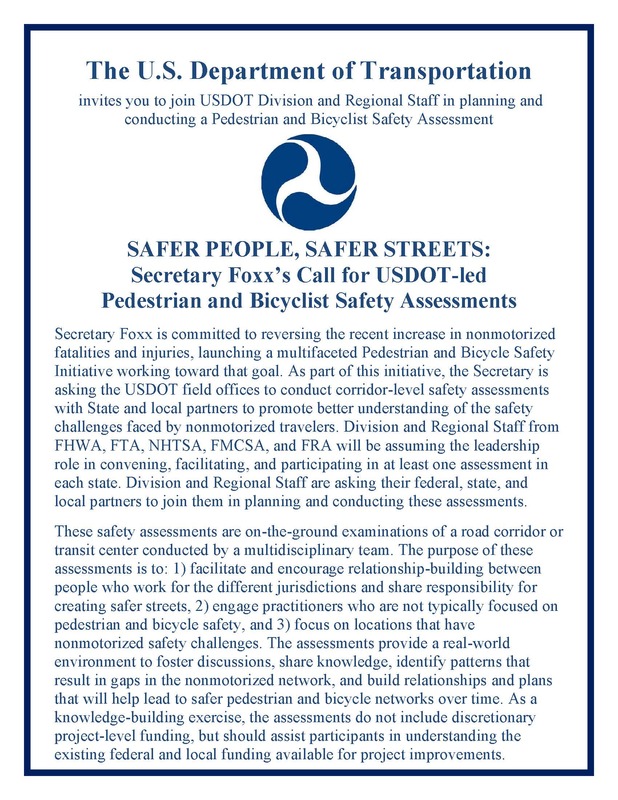 These safety assessments are part of the U.S. Department of Transportation’s “Safer People, Safer Streets” initiative, where Transportation Secretary Anthony Foxx mandated USDOT field offices to partner with state and local communities to do corridor-level safety assessments. 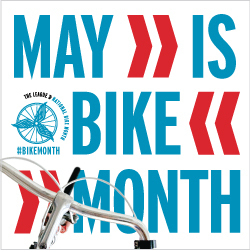 One of the reasons for these tours is to help transportation planners, state and local officials, and others learn more about some of the challenges faced by non-motorized transportation users. The safety assessment tours are free and open to the public. 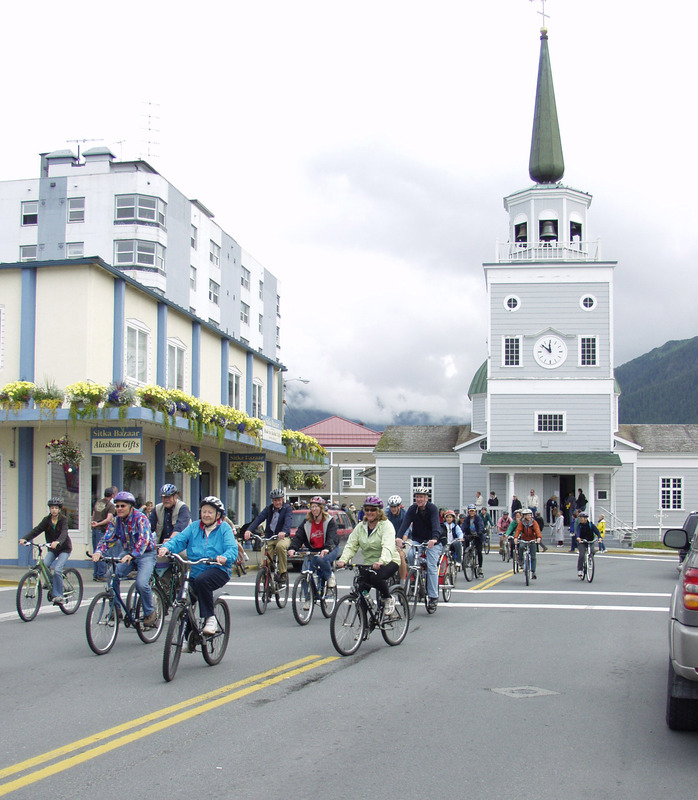 In addition to the publicly announced safety assessments, federal, state and local representatives will be walking and biking other parts of Sitka to rate those areas. One of the additional walking assessments will be of Katlian Street and interested participants can meet with Paul at 2 p.m. on Wednesday, May 6, at the Totem Square Inn hotel lobby. For more information and to RSVP for the free tours, contact Paul Wistrand at 1-907-586-7148 or paul.wistrand@dot.gov.